Brian Terry burst onto the zydeco scene in the mid 1990s with his band Lil’ Brian and the Zydeco Travelers and recorded two remarkable discs for Rounder that mixed the traditional sounds of zydeco with healthy doses of hip-hop, funk, and even some rap. Dubbed by Terry as Z-Funk, the style was an impressive attempt to catapult the music into the 21st century and Terry was able to mix and mold smoothly enough to actually satisfy both traditional zydeco fans and newcomers, no mean feat in itself. 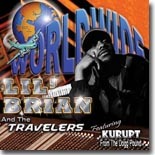 Over a decade later, Lil' Brian and the Travelers (having dropped the “zydeco” from their name) are still at it, with their latest release, Worldwide (Freh’toi Records). Influenced and encouraged by the legendary Buckwheat Zydeco, Terry learned his lessons well, as he proudly displays his chops on both the piano-style accordion and the old diatonic. Unlike a lot of hip-hop, Terry sings a good bit more than he raps. Adding even more hip-hop credibility to the proceedings is Kurupt, from the Dogg Pound, who raps with Terry on “Funky Zydeco,” which shows that Terry listened to George Clinton as much as he did Buckwheat in his formidable years. The P-Funk influence really shows on “Funky Feel’in” as well. Other highlights include the lively “Bounce,” the extremely funky “Popcorn,” and “Jam Y’all,” with its 70s vibe. “Ducema” has a more traditional feel to it, but still packs a solid groove, as does a remix of the Rockin’ Sidney tune, “Good For the Goose, Good For the Gander.” A cover of Bob Marley’s “I Shot the Sheriff” adds horns and throws reggae rhythms into the mix. Worldwide has the potential to invigorate the hip-hop genre almost as much as it does the zydeco genre. As one of the most forward-looking artists in zydeco, Brian Terry has an opportunity offered to few musicians, the chance to breathe new life into a still-vital music, and maybe shake things up in some others in the process. 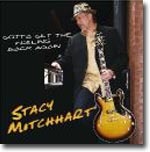 Stacy Mitchhart’s latest release (his ninth), Gotta Get The Feeling Back Again (Dr. Sam Records), shows that the Nashville-based bluesman is the real deal, taking the blues in interesting new directions. Gotta Get The Feeling Back Again consists of eleven songs, seven originals and four covers. Mitchhart shows an ability to compose songs with catchy hooks (as experienced on the soul track “Can’t Get Enough Of Your Lovin’”). “The Blues Has Got You Bad” is also a strong tune that many everyday fans can probably relate to, and “Better Off Without You” will ring a bell for those who have trouble getting out of a bad relationship. “Doghouse Blues” has a nice country quality to it (complete with jug, banjo, and fiddle). While admittedly not a big Led Zeppelin fan, Mitchhart manages to breathe new life into a medley of Led Zep tunes (“Black Dog/Whole Lotta Love”) by turning them into a loose acoustic Delta Blues workout with fantastic results. He also tackles the Allmans’ “Whipping Post” in a similar manner, giving it a jazzier, soulful touch. The other two covers, “I’ll Play The Blues For You” and a live version of “Blue Monday,” are played a little more straightforward and closer to their original versions, but include some of Mitchhart’s best guitar. With a strong band providing excellent support, Gotta Get The Feeling Back Again is an impressive mix of strong original compositions and some clever interpretations of classic oldies. Mitchhart is not only a first-rate guitarist and singer, he's an excellent composer. There’s a good chance that you'll be hearing some of these songs by other blues artists in the near future. All in all, this is a great set of blues with a touch of funk and soul thrown in for good measure. Dialtone Records’ latest release continues their tradition of documenting previously unheard of Texas-area musicians. 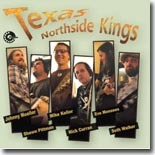 Texas Northside Kings deviates somewhat from previous releases, which featured older, previously obscure local musicians, because it features six of Austin’s hottest young guitarists: Eve Monsees, Johnny Moeller, Shawn Pittman, Nick Curran, Seth Walker, and Mike Keller, all of which have appeared on their own recordings or in support of others. Pittman, who’s recorded with Susan Tedeschi and has a couple of solo releases, has three cuts, including the rollicking “I Don’t Need No Sugar Mama” and a great cover of “Reap What You Sow.” Curran, who’s recorded for Blind Pig and is also the current Fabulous Thunderbird’s guitarist, offers throat-shredding vocals and searing guitar on his three tracks (Howlin’ Wolf’s “I’ll Be Around,” Little Walter’s “Oh Baby,” and a fun take on “Slippin’ and Slidin’”). Backed by a stellar band including Barnett, Gilliam, drummer Willie Sampson, and Jeffrey Plummer on bass, Texas Northside Kings is an outstanding effort that will please blues fans. Texas bluesman Randy McAllister’s latest release, Dope Slap Soup (Reaction Records), features more of his innovative songwriting and is in more of a soul bag than his earlier releases. McAllister has always been hard to pigeonhole because he’s comfortable playing not only blues, but soul, rock, and even country. While probably giving record stores a headache as far as where to file his recordings, it’s a good thing for fans since he’s more than capable in each genre. There are also a few of those story songs McAllister does so well, with “Baptist Church Van,” “$127.00 Sandwich,” and “Can’t Pick Your Relatives.” The closing track, “Steady Decline,” is a genre-buster that features blues-rock guitar, a soulful B-3, gospel-style backing female vocals, and inspirational lyrics. However you categorize it, you’ll love it. This is another fine effort from McAllister, who is as appealing a singer and harmonica player as he is a composer. He gets strong support from Morgan, Matt Woodburn, Mitchell Smiley, and Todd Blalock on guitars, Chuck “Popcorn” Louden and Danny Cochran on drums, Sonny Collie on bass, Mike Hanna and Tim Alexander on keyboards, and Benita Arterberry-Burns and Angie McWhirter on backing vocals. This is powerful stuff, wherever you file it. Though he was a major part of the blues scene in the 1950s and early 1960s, Jimmy Reed has long been one of the tragic figures of the genre. Despite having many records that made the music charts, he struggled with alcoholism and epilepsy (long undiagnosed), and never had much to show financially for his success. One of the lasting images I have of Reed is a publicity shot of him with guitar and harmonica, looking sharp in a suit and tie, sitting on a stool with duct tape holding the bottom together. He just always seemed to deserve better than he got. Reed’s catalog of songs, all featuring his earthy harmonica and rhythm guitar along with the highly underrated Eddie Taylor’s lead guitar, have been part of many blues bands’ repertoire for years and continue to be even today. Whatever your feelings may be about the complexity of his music, you can’t argue with the fact that those rudimentary rhythms influenced countless younger musicians back in the day, like Elvis Presley and the Rolling Stones. Probably most of the guitarists who got their start in the ’60s knew at least one or two Jimmy Reed tunes. One of these was Mississippi native Omar Kent Dykes. Best known as the “Omar” in Omar and the Howlers, Dykes has spent the past three decades plus singing and playing the blues. 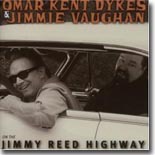 The first song he ever tried to play on a guitar was Reed’s “Big Boss Man.” Dykes wanted to do a Reed tribute record for years and finally seized on the opportunity, teaming up with guitarist extraordinaire Jimmie Vaughan to release On The Jimmy Reed Highway (Ruf Records). Vaughan is a tower of strength on the guitar, as always a model of consistency and taste. His solo on “I’ll Change My Style” should be featured in the guitar textbook as the model for a blues guitar solo. Also on hand are two longtime Vaughan associates: singer Lou Ann Barton and harmonica ace Kim Wilson. James Cotton, Gary Primich, and Delbert McClinton (who sings co-lead vocals on “Hush Hush”), also make guest appearances as well. Barton is the unsung hero (no pun intended) on this collection, contributing sensual lead vocals and backing vocals on nearly all the tracks. Some of the familiar Reed tunes are present, including “Big Boss Man,” a medley of “Baby What You Want Me To Do/Bright Lights Big City,” “Aw Shucks, Hush Your Mouth,” and a dandy cover of Eddie Taylor’s classic, “Bad Boy.” There are also some pleasant surprises from the Reed catalog as well, rarely heard tunes such as “Good Lover,” a nice, smoky duet between Barton and Dykes, “I’ll Change My Style,” “Baby, What’s Wrong,” and “You Upset My Mind.” The only non-Reed songs present are the title cut, which is a nice homage to Reed that avoids being corny, and the closing track, “You Made Me Laugh,” Dykes’ fond remembrance of his wife, who passed away a couple of years ago after a lengthy bout with cancer. This is a wonderful tribute album in more ways than one. Not only will you want this one for the great performances, but it should also encourage blues fans unfamiliar with Jimmy Reed to check out his wonderful recordings, which are available in numerous compilations. Those who delve deeper will be glad they did. 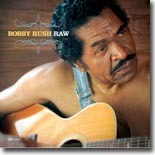 Since starting his own record label, Deep Rush Records, several years ago, Bobby Rush has built an exceptional catalog. He released a live CD/DVD that captures his stage act as perfectly as possible (Live At Ground Zero), a funky blues session with Alvin Youngblood Hart that ranks with his best recordings (Folk Funk), two sets of his trademark soul/blues (Undercover Lover and Night Fishin’), and also two collections of his rare early recordings (The Essential Recordings). Rush’s latest effort, Raw, is a stripped-down return to his roots. Rush goes the solo route on this set, playing guitar and harmonica on 13 mostly original tracks, though he’s accompanied on three tracks by former band member Shawn Kellerman on dobro. While Rush has long been regarded for his harmonica proficiency, he acquits himself pretty well on guitar, mostly playing rhythm. Kellerman’s backing is first-rate. While the tracks on Raw are mostly originals (the lone covers being Larry Williams’ “Boney Maroney,” John Lee (Sonny Boy I) Williamson’s “School Girl,” and Muddy Waters’ “Howlin’ Wolf”), many of the tracks borrow lyrics and ideas from other artists, such as Waters, Ricky Allen, Rice Miller (Sonny Boy II), and Willie Cobbs. While some may scoff at the idea of these being “original” songs, it should be noted that blues artists throughout the years, including that noted blues composer Willie Dixon, have done the same thing --- taking old lyrics and themes from others and transforming them into their own voice. Rush has long been one of the best at doing this. A lot of the songs deal with typical Rush themes, such as conflict between the sexes (“I Got 3 Problems,” “Knockin’ At Your Door,” “9 Below Zero”), but Rush also tackles current events as well. While this is a previously uncharted path for him, he proves to be more than up to the task. “What’s The Use” takes the basic theme of Allen’s “Cut You Loose” and transforms it into a cry of frustration about a man who’s worked hard all his life and has nothing to show for it. “How Long,” where Rush asks for his long-promised 40 acres and a mule, walks the same path of frustration and anger. Another song, “Uncle Esau,” goes back to Rush’s childhood (in fact, I remember my grandmother singing me the second verse when I was a child) and was previously featured on Folk Funk. This is a side of Bobby Rush that many of his longtime fans will be unfamiliar with, but listeners will be pleasantly surprised at how easily he’s able to pull it off. Rush is not afraid to try something new, something that can’t be said about many artists with over 50 years in the business. Bert Deivert was born in Boston, Massachussets in 1950, but now lives in Sweden. His original music influence was Son House, and this shows in some of his music, although there are lots of other influences apparent as well – Mississippi John Hurt and Tommy Johnson are two that stand out. A couple of the tracks on Takin' Sam's Advice (Gravitation Records) put me in mind of the playing and singing of Richard Ray Farrell on his acoustic album, another accomplished modern bluesman. This CD is the first that I’ve heard of Bert’s music, although he has previously made albums with Eric Bibb and Tom Paley, but what an introduction to his music it has turned out to be. There is only one original track amongst the 14 on the CD, but that is no criticism because the tracks that Bert Deivert has covered are varied and of top quality. For fans of acoustic blues, this CD is a very valuable addition to any collection, and I just can’t stop playing it. The album opens with a very well done version of Yank Rachell’s “Seems Like A Dream,” including some inspired mandolin playing! Tommy Johnson’s “Big Road Blues” follows, slowing the pace down a little and leading into the highlight of the album (for me, anyway) – “Preachin’ Blues,” the Son House classic. This track, as well as Bert’s version of another Son House number, “Levee Camp Moan,” would make me buy the CD on their own. This is where the Son House influence shines through, and these are two of the best covers of Son House songs that I’ve ever heard, with faultless slide guitar work that I’m sure the great man himself would be proud of. The fact that these two tracks are so good shouldn’t detract from the quality of the other 12 tracks, because I don’t think that there’s a bad one amongst them, including the original “When You Got A True Friend,” which was written by Bert Deivert and Brian Kramer (who plays National steel on this track and "Big Road Blues"). There are some old traditional blues songs – “Silver City,” “Mississippi Blues,” “Crow Jane” and “Morning Blues,” and some more good covers – songs by Bo Carter, Jimmy Rogers and Sleepy John Estes, and a couple more Yank Rachell numbers. The other musicans on the album deserve a mention too – they provide great support. As well as Brian Kramer, mentioned above, listen out for the fiddle playing of Nina Anderberg (especially on “My Baby’s Gone”). There’s Gunnar Backman on banjo, Lasse Bostrom (guitar), Peter Case (harmonica, guitar and vocals), Emmy Deivert providing backing vocals on “Crow Jane,” Dan Magnusson (drums), Tom Paley (guitar on “Divin’ Duck), Per-Arne Pettersson (double bass), Mats Qwarfordt (harmonica) and Janne Zander on various guitars. 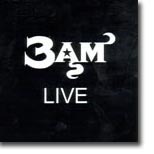 3AM Live is a CD by a band, 3AM, that is, sadly, largely unrecognised outside of the South of England. This is a great shame because they are a very accomplished band with a superb sound. For this CD, they’ve chosen some material that wouldn’t naturally occur to a blues band, and that goes a long way to making them a little unique. The recording quality, for a self-produced and live recorded album, is excellent, as is the music quality too. Vocalist Helen Turner has a very distinctive voice, well suited to the blues – a bit like a cross between Janis Joplin and Maggie Bell – and she uses it to good effect. She shows in her music that she has been influenced by both of the singers mentioned above by including some of their songs in her playlist, and she is equally at home with up tempo tracks and with slow ballads. On top of this, the band behind her are first rate. I’ve played this CD a few times now and I can’t detect a bum note – not always something you can say about a live album. The CD opens with the Maggie Bell song “Good Time Girl” – and it’s not a bad choice for the first song as it gets your foot tapping fairly quickly. It leads into “What You Got” and is followed by the first of the odd choices that I mentioned earlier, the Beatles “I saw Her Standing There.” It actually translates fairly well into a bluesy number, but unfortunately Helen Turner falls into the familiar trap of singing it with the original words, instead of changing it slightly so that it’s sung from a female point of view. This is a small criticism of an otherwise good track, but it would sound so much better if she changed it a little. Carol King’s “Natural Woman” follows – again, not a track that you would normally associate with the blues. The CD is available from the band’s website, www.3am.uk.com, and it’s well worth a good listen.